Imelda Marcos, the 89-year-old former first lady of the Philippines, was sentenced to 42 years in prison on Friday, but appeals and her advanced age make it unlikely that she will spend time behind bars. MANILA — A Philippine court on Friday sentenced Imelda R. Marcos, the country’s flamboyant former first lady, to a minimum of 42 years in prison for creating private foundations to hide her unexplained wealth. But it is unlikely that Ms. Marcos, a 89-year-old widow, will see any jail time. The court, which handles graft and public corruption cases, said the ruling could be appealed, and legal experts have said Ms. Marcos could fight a prison sentence because of her advanced age. The sentence comes as Mrs. Marcos and her family have seen a political resurgence in the Philippines, having gained favor under the presidency of Rodrigo Duterte. The court found her guilty of seven counts of graft, with each count punishable by a minimum of six years in prison. The ruling also automatically disqualifies Mrs. Marcos, who is a congresswoman, from holding any public office. Mrs. Marcos did not appear in court for the sentencing, and a warrant was issued for her arrest. In a statement later Friday, Mrs. Marcos said her lawyer was studying the ruling and intended to file a motion asking the court to reconsider it. The lengthy sentence drew praise from some leading opponents of Mr. Duterte, who has in the past praised the brutal dictatorship of Mrs. Marcos’s deceased husband, Ferdinand Marcos. Loretta Ann Rosales, the country’s former human rights commissioner, who was tortured as an activist in the 1970s for opposing Mr. Marcos, called the sentence a symbolic victory for the thousands who died resisting the dictatorship. She said the ruling also proved that the Marcoses and their cronies were guilty of raiding government coffers in order to enjoy a lavish lifestyle while millions of Filipinos lived in poverty. Neither Mrs. Marcos nor her lawyers could immediately be reached for comment. The charges against Mrs. Marcos took more than a quarter-century to prosecute, largely because many people who could have been witnesses had died or were too old to testify. The charges were filed in 1991, when state prosecutors accused Mrs. Marcos of creating private foundations in Switzerland and having financial interests in several companies when she was governor of Manila between 1978 and 1984. Prosecutors said the fake firms hid money that her family stole from the government. The prosecutors wrapped up their presentation in 2015, but Mrs. Marcos’s lawyers successfully delayed the hearings by not appearing in court. Among those who testified against Mrs. Marcos was Frank Chaves, the country’s late solicitor general, who filed a sworn statement that said Mrs. Marcos had used the foundations in Switzerland to hide millions of dollars of stolen wealth. The government successfully recovered some $658 million that the Marcoses held in Swiss financial institutions. But officials believe that is just a fraction of the roughly $10 billion they say the Marcoses stole from the Philippines. Ferdinand Marcos’s two-decade rule was ended by the 1986 “people power” revolution. 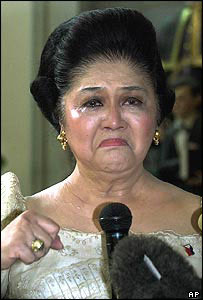 The Marcoses were sent into exile in Hawaii, where Mr. Marcos died three years later. The family was subsequently allowed to return home, where they re-established a base in their hometown, Ilocos Norte, in the northern Philippines. The Marcoses’ political fortunes surged after Mr. Duterte was elected president two years ago. Mr. Duterte, who often describes himself as a fan of the late dictator, has credited the Marcos family with consolidating support for him in the north. In 2016, he allowed Mr. Marcos’s remains to be reburied in a heroes’ cemetery in Manila, leading toprotests. Mr. Duterte has also backed Ferdinand Marcos Jr.’s appeal of his narrow loss in the vice-presidential election that year. A spokesman for Mr. Duterte, Salvador Panelo, said Friday that the president respected the court’s decision. “While we note that there are still legal remedies available to Congresswoman Marcos, this latest development underscores that our country currently has a working and impartial justice system that favors no one,” Mr. Panelo said.